Here she is: the final post in my Hopped Cider Trilogy. This has been an interesting journey for me. Not being a beer drinker, the idea of hopped ciders was immediately unappealing to me. Hops means beer, and beer means bitter, weird earwax flavours to me (don’t look at me like that, you know exactly what I’m talking about). So, exposing my bias, how did these ciders fare? Read on! Ingredients: 100% New York State Fermented Cider, Apricot Puree, Potassium Sorbate. Snail for scale. Note: I poured it indiscriminately and it resulted in a lot of floating sediment. It settled shortly after this photo. The Nose: Very fresh and lightly fruity. A little apple, a little apricot (again, both “fresh”). Sourness. This doesn’t have much of a fermented or “over-ripe” fruit scent at all. I didn’t pick up any hops at all, strangely. Overall: it smells nice. The Colour: Very pale pure yellow. The photo was taken under a very warm light which makes the cider come across as a lot more golden than it really is. Cloudy, obviously. The Taste: Light hops balanced with lightly sweet apricot. Slightly, slightly tart/sour– just enough. Subtle apple flavour. I’m using the word “light” a lot here, but I don’t want to give the impression that there’s nothing “there”; the flavour isn’t immaterial. It’s just beautifully balanced and subtle. It’s not too sweet that I couldn’t enjoy a few glasses on a really hot day. The Verdict: I like this. A lot. That said, I love apricot. This manages to impart the “full” and fleshy taste of fresh apricots, without being too sweet or coming across as gimmicky. And the hops? The hops definitely add to this cider– I’m not sure I’d like it as much without them. The subtle cascade hops serve to balance out the sweetness and keep the cider fresh and airy. Overall: would absolutely drink this again. I’d give this an incredulously impressed nod-n-smile out of … the appropriate corresponding measurement. 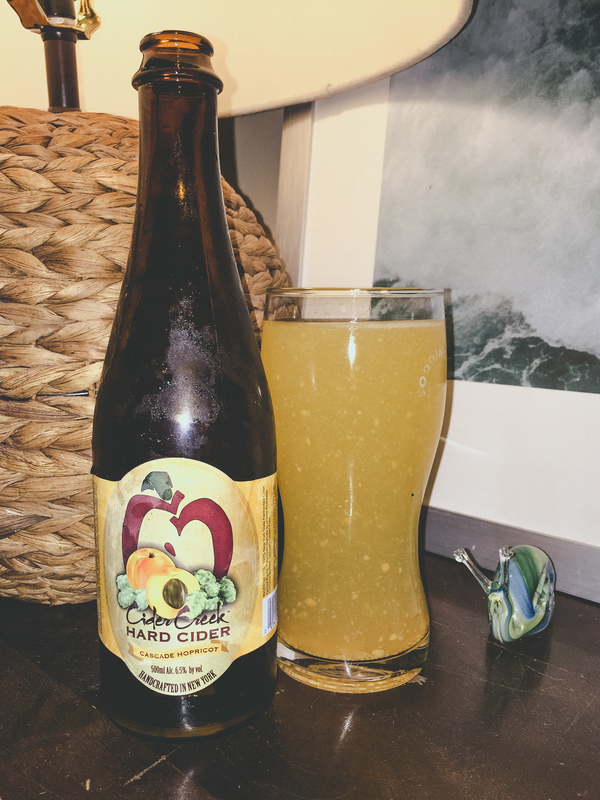 Have you tried Cider Creek’s Cascade Hopricot Hard Cider? What would you rate it? Tell me about your experience with it below in the comments. This entry was posted in Cider Review and tagged Apple Cider, Apricot, Cider Creek, Gluten Free, Hopped Cider. Bookmark the permalink. ^ erica – Currently in stock at the Brentwood Liquor Depot!